Americans back the deal with Iran by a 2-to-1 margin, but also say U.S. should use military power to protect Israel. Americans back the newly brokered nuclear deal with Iran by a 2-to-1 margin, a Reuters/Ipsos poll released Tuesday found. U.S. citizens are also very wary of their country resorting to military action against Tehran even if the diplomatic effort falls through, the poll found. 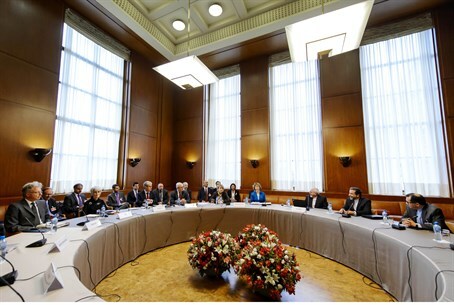 According to the survey, 44 percent of Americans support the interim deal reached between Iran and six world powers in Geneva last weekend, and 22 percent oppose it. While indicating little trust among Americans toward Iranian intentions, the survey also underscored a strong desire to avoid new U.S. military entanglements after the wars in Iraq and Afghanistan. Even if the Iran deal fails, 49 percent want the United States to then increase sanctions and 31 percent think it should launch further diplomacy. Only 20 percent want U.S. military force to be used against Iran, the poll found. On Tuesday, the administration again warned that passing new sanctions on Iran would jeopardize tough negotiations on Tehran's nuclear program. Over the past few weeks, even before the deal with Iran was reached, the Obama administration has been waging a very aggressive campaign to dissuade senators from pursuing new sanctions. Reflecting deep suspicions over Iran's sincerity after more than three decades of estrangement between the two countries, the poll also found that 63 percent of Americans believe Tehran's nuclear program is intended to develop a bomb. Despite that, 65 percent of those polled agreed that the United States "should not become involved in any military action in the Middle East unless America is directly threatened." Only 21 percent disagreed with the statement. There was every indication, however, that American public support for Israel remained high. Fifty percent supported the notion that the United States "should use its military power to defend Israel against threats to its security, no matter where they come from." Thirty-one percent disagreed.